Tilda Swinton Is In Talks For Doctor Strange! 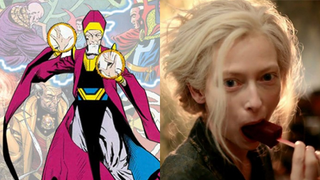 Ready your “Holy Tilda Swinton!” gifs, because Holy Tilda Swinton: The Hollywood Reporter is reporting that Tilda Swinton will have a part in Marvel’s Doctor Strange. It’s for none other than Stephen Strange’s mysterious magical teacher, the Ancient One! Yes, the Ancient One — who teaches Strange magic after a terrible accident befalls him, guiding him on the path to becoming the Sorcerer Supreme — is usually a male role, and according to THR, Marvel were originally looking for a male actor. However, they’ve allegedly decided to make the role female, and are currently in final talks with Swinton to take it on. It’s cool to see Marvel changing it up for a bit more diversity (but also a slight bummer that the actress being considered isn’t Tibetan, as the Ancient One is), but also wow, Tilda Swinton in a Marvel movie! That could be great. Tilda Swinton and Benedict Cumberbatch. Is it just me or is magical ability in Doctor Strange going to be measured by the flawlessness of your cheekbones?